Yes, the room *still* looks like that. Anyway, while we aren’t quite up to green lighting a project of that scope (financially), we are on the edge of actively getting a couple of other projects done around the house. One is inside. The other is outside. The first project is something that I’ve been putting off since, wow, October of 2003. My original-to-the-house coal burning furnace (converted to oil in the 1950’s) died and I made the decision to switch from oil to natural gas. I had some contractors come in — three outrageously friendly Jamaican guys — to replace the furnace (which was roughly the size of my car) with a much more efficient gas burning one roughly the size of a 19-inch television. Total cost was $5208 and was certainly not a welcome expense at the time. Thankfully that was paid off in January of 2005. So what’s the deal now? Well, being Type-A, in September of 2003 I had my oil tank filled in preparation for the winter. Normally, that would be a really wise financial move. I never used a drop of it. So, for the past 6 years, I’ve had an environmental disaster waiting to happen in my basement. 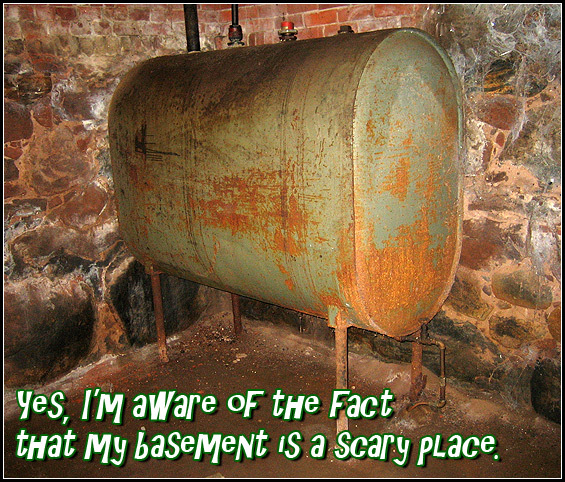 If my oil tank were in great shape, I wouldn’t sweat it, but that’s the thing… The oil tank looks, well, prone to failure. Now is the time to get it pumped dry and out of there, you know, before I have the government labelling my property as some sort of environmental wasteland and forcing the whole neighborhood to be evacuated for some sort of clean-up by strange men in space suits. I have no idea how much this will cost. I like to think that I could make some money on the deal — heating oil today is worth a lot more than what I paid for it back in 2003 — but from what I’ve heard, that isn’t the way it works. Some local oil company will come in, pump it out, charge me, and them pump it right back into someone else’s oil tank and then charge them. Hardly seems fair. Why not go buy a bunch of 5 gallon oil cans, pump it out yourself and then sell the oil cans (oil and the can itself) for some amount of money? Surely there has to be a market for it. Try Craigslist. You may need to filter it, but that shouldn’t be too hard. what year was the oil tank made and who made it?